This tutorial is designed to help you score and interpret the COPSystem VIA self-scoring versions of the COPS Interest Inventory, CAPS Ability Battery, and COPES Work Values Survey assessments using the COPSystem VIA Comprehensive Career Guide. After completing the COPS Interest Inventory, open your booklet to the last page and sum across each row. Count three for each capital “L” answer, two for each lowercase “l” answer and one for each lowercase “d”. Nothing is added for a capital “D” (Dislike very much) answer. Since there are three answers in each row, the maximum possible score for a row is 9. Record these sums in the spaces in the far-right edge of the answer page starting with the first sum labeled A1 and so on down to the last sum at the bottom of the page labeled N3. After completing this step there will be a scale score in each of the lettered spaces in the far right-hand column. After scoring the COPS Interest Inventory booklet as described above, turn to the Summary Profile Sheet (page 2) in the COPSystem VIA Comprehensive Career Guide to plot the interest profile. Read across the top and the bottom of the boxes in the row labeled Total Score near the bottom of the page on the Profile Sheet. Every second box is in alphabetical order. Obtain the scores to be plotted on this sheet by adding the three “A” scores in the test booklet, then the three “B” scores and so on through “N”, entering the total scale score in the corresponding box on the Profile Sheet. Be sure all three scores are summed for each letter. The three “A” scores will be recorded on the lines above the “A” box, added together with the sum entered in the box lettered “A”. Do this for all boxes “A” through “N”. Be sure to skip a box to record the “B” sum. The boxes in the rows labeled “INTERESTS 1”, “ABILITIES 2”, and “VALUES 3” should be left blank at this time. The next step is plotting the profile. The column on the Profile Sheet labeled “M” is for males and the shaded column labeled “F” is for females. To compare the interest scores with those of males, mark the scores in the columns labeled “M”. If you wish to compare scores with females use the columns labeled “F”. Mark the score with a dot on each of the 14 scales and then connect each score with a straight line. Place a plus (+) mark in each box on the row labeled “INTERESTS 1” for the three columns showing the three highest interest scores. The plotted COPS interest profile will help you compare interests with those at the educational level indicated on the profile sheet (either High School or College level) within 14 major occupational groupings. After plotting the profile as described above, look at the highest peaks. These are the occupational groups in which interests are strongest as compared with others. To compare scores with others who have taken the Interest Inventory, refer to the numbers (percentile scores) in the extreme right- and left-hand columns on the profile. If the score is at or near the midline, about half (50%) of others fall below this score. If a score falls at a point represented by a percentile score of 75, the interest indicated in this occupational group is greater than about 75% of others. The higher the score, the higher the level of interest in that group as compared to others who have taken the Interest Inventory. Sometimes there are more than three scores above the 75th percentile, as may be seen in the profile above. In these cases, it may be advisable to mark four or five pluses (+) (for the interest scores only) on the profile to indicate that these are occupational areas with a strong enough level of interest to merit further exploration. Typically, there will be one or two occupational areas in which the profile is high. These are the areas in which exploration of specific occupations should be directed. The brief descriptions on pages 5 through 11 of the COPSystem VIA Comprehensive Career Guide will help in understanding the nature of the occupations in each area. Except for the Clerical, Outdoor, and Communication occupational areas, scores are presented first for professional occupations, usually those requiring college training and often advanced degrees, and second for skilled occupations requiring vocational or on-the-job training in which a college degree may not be required. Sometimes scores in certain areas will be high for both the Professional and Skilled scales. This would suggest that occupations at various levels of training and responsibility might be equally satisfying, and the choice of occupation might be based on such considerations as opportunities in occupations at various levels, and difficulty of getting advanced education. In some cases, skilled level occupations may be used for entry to professional level occupations. After completing the ability battery, open test 1 MR carefully by tearing off the right-hand strip with the holes. Continue by opening the top and bottom of the page to reveal the inside page. Count all the boxes connected by the shaded line that have marks in them. Do not count any marks through which you have made an “X”. Record the total in the box on the same page. When you have completed this process for each test, write the total score of each test in the correct box on the Summary Score Sheet, in the column marked “Record your test scores here”. 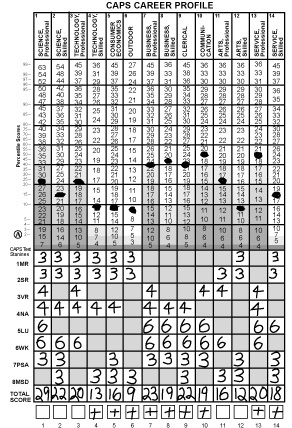 While looking at the appropriate grade level chart, find the score for each test in the shaded area and circle the whole box that includes the shaded numbers above and the single number in the white portion below. The single numbers in the white portion are the stanine scores for each test. 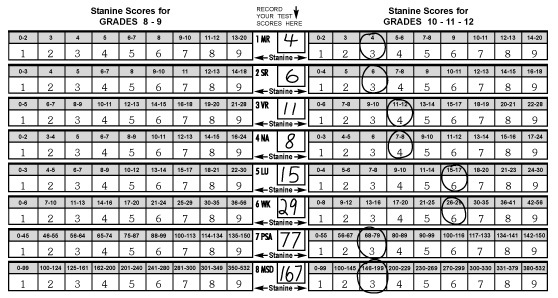 Use the Abilities Career Profile, located in the COPSystem VIA Comprehensive Career Guide on page 3, and place the stanine score (ranging from 1 to 9) for test 1 MR in every unshaded box in the row marked 1 MR. Next, find the stanine score for test 2 SR and enter this score in every unshaded box in the row marked 2 SR. Repeat this process for the remaining ability tests. Now total down each column and record the total score along the bottom row. Mark the total score with a dot on the corresponding column above. If a total score falls in the white portion of the column or at the upper edge of the shaded portion, place a plus mark (+) in the empty box at the bottom of the ability profile. These are areas where measured abilities indicate enough aptitude to perform the tasks associated with jobs in this cluster. If a total score falls in the dark portion of the profile, further education or training in this area should be considered if a career in this cluster is of interest. 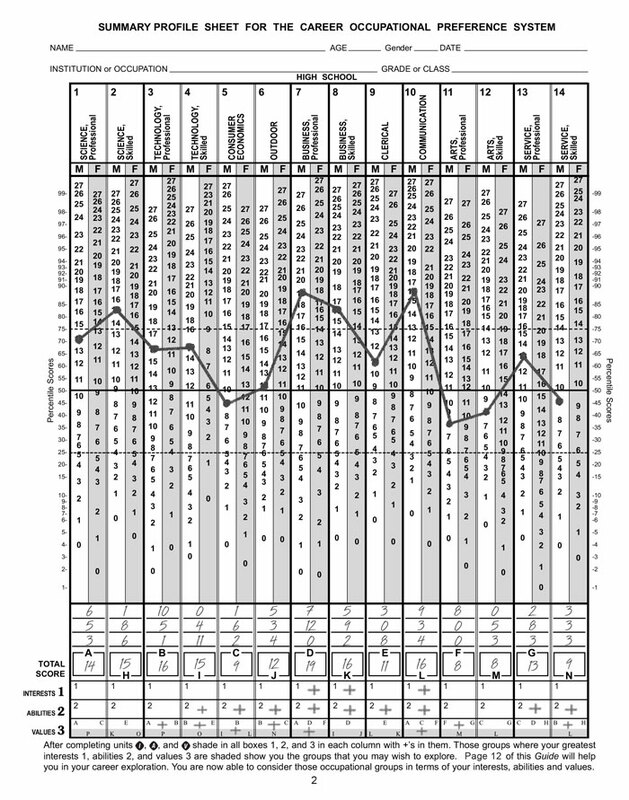 Find the Ability Profile in the COPSystem VIA Comprehensive Career Guide (page 3, lower right-hand corner) and enter the stanine scores in the appropriate boxes. Mark stanine scores below on the graph with a dot and draw a line starting one stanine above the score down through the score to the stanine one less than the score. This shows a range of +/- 1 stanine for each ability test. The Career Profile will compare measured abilities to abilities required on jobs in the 14 major occupational groups described on pages 5 through 11 of the COPSystem VIA Comprehensive Career Guide. 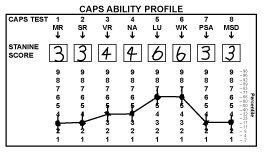 Each Ability career group score on the Profile is based on a combination of individual ability test stanine scores. Stanines are scores which range from 1 to 9. On any one test, a score of 9 represents the highest possible score and a stanine of 1 the lowest possible score. A stanine of 5 shows middle or average ability compared to others at that educational level. Career group scores are made up by combining stanine scores for job abilities of each group. The combined score is a way of estimating success in most of the jobs in a career group. Each career group column contains a shaded portion. Only the white section above the shaded area represents a level of ability that suggests probable success in the occupations within that career group. Look at the scores you have darkened on the Ability Career Profile. Some of these may fall in the shaded portion and some in the white portion. 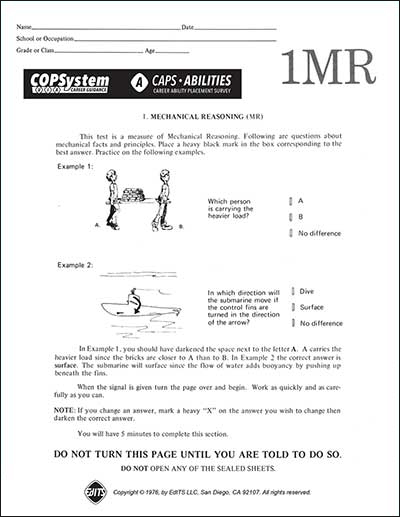 If a score is in the white portion or at the upper edge of the lightest shaded portion put plus marks (+) in the boxes on the row labeled “ABILITIES 2” on page 2 of the COPSystem VIA Comprehensive Career Guide. These are areas in which abilities measured are sufficiently high to suggest a probability of success currently. However, it is important to remember that future success will depend on long-term training in the skills and knowledge required by jobs in these clusters. For profile interpretation, concentrate on the distance of the scores from the dark shaded areas. Peaks in the profile may not be significant because the shaded areas are different heights. Consider whether other things known about the examinees are consistent with their profile. On career clusters where ability scores are in the dark portion of the Career Profile, and interest and motivation are high, examinees are likely to benefit from courses that are intended to improve upon their skills and increase their knowledge. After completing the Values assessment, open the booklet to the last page and sum across only those rows with a dot immediately in front of either the “a” or “b”. Count the number of answers in the row that has the dot. Record the sum in the space at the far left of page 4, starting with the first sum labeled “a1”. Continue down the column until you finish at sum “h2”. Since each summed row only has four possible answers, the highest possible score for any row is 4. Only sum the responses on a row that are preceded by a dot immediately in front of either the letter “a” or “b” as shown above by the blue circles. It may be easier to do this using a ruler or straight edge as you move down the page. When you have finished this step, there will be a score in each of the lettered spaces in the far left-hand column. After scoring the Values assessment, go to the profile on page 4 of the COPSystem VIA Comprehensive Career Guide. Get the total scores in COLUMN 1 for this profile by adding the two “a” scores, the two “b” scores, and so on through “h”. Be sure the two scores are summed for each letter. The two “a” scores may be recorded in the small boxes beside the “a” box, then added together so that the total can be recorded in the box lettered “a” for a total score on that scale. Continue to repeat this step for all boxes labeled “b” through “h”. The next step is plotting the profile. Shade the total scores in each of the eight rows with a mark. Then connect them with a straight line. Next go to each row and draw a line to make a bar from the marked score to the next lower score below on the left and to the score next higher on the right. For example, if the score is a 6, the bar would go from 5 to 7. The reason for the bar instead of a point is that a survey is not a perfect measure of one’s true work values. However, it can be reasonably expected that the examinees’ value score is within the marked range. The last step is to identify the most dominant values for further consideration. To do this, find the three separate scores that are farthest from the midline in either direction. For example, all three may be to the far right; or two may be to the extreme right while the third is on the extreme left. The small capital letter above each of these three scores will identify the greatest work values. Circle each of these three values in COLUMN 3 and put a plus (+) by each of these letters on page 2 of the COPSystem VIA Comprehensive Career Guide in the row labeled “VALUES 3”. If you cannot easily determine which three scores are the most distant from the midline, look at the entire coded score above each of the shaded scores. Record this letter and number in the appropriate box in COLUMN 2 coded score to the right of the profile. For the top three scores in COLUMN 2, circle the corresponding scales in COLUMN 3 based on the example above. 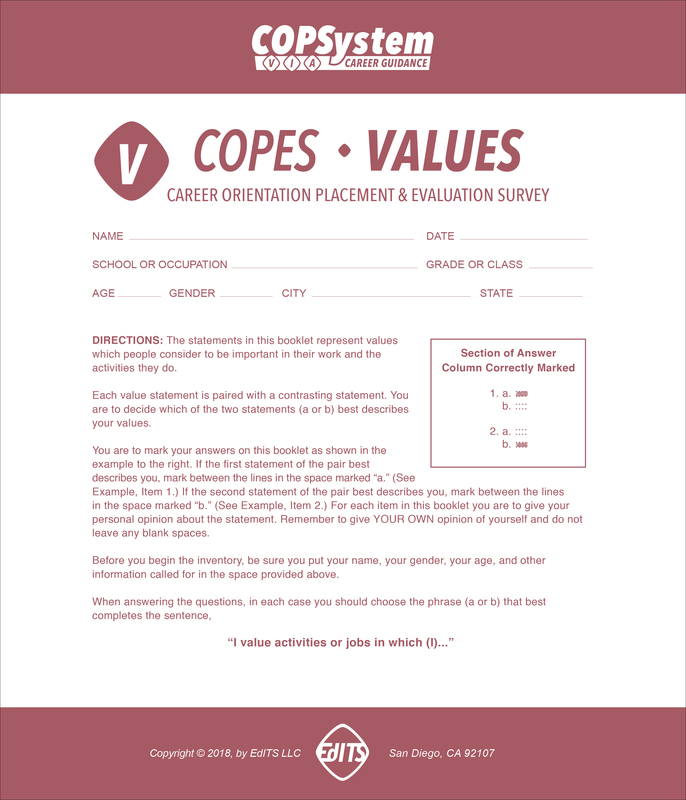 In the case of ties for the 3rd greatest value, descriptions on the top of page 5 of the COPSystem VIA Comprehensive Career Guide may be read by the examinee to help choose which values should be considered in terms of future career choices. Next, put a plus (+) in every box in the row marked “VALUES 3” on page 2 of the COPSystem VIA Comprehensive Career Guide with any of the letters for the circled scores located farthest from the midline. When examining the profile you should determine your three most important values areas. These are the three scores that are farthest from the midline, either to the left or right, and thus are your most important work values areas. 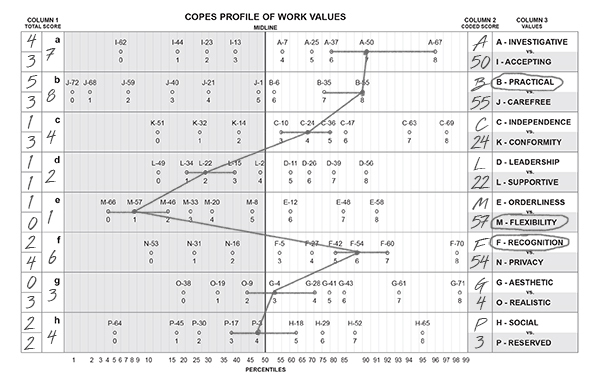 The work values measured by the COPES are related to the COPSystem VIA Career Clusters and the chart below shows the relationship between the work values areas and the career clusters. You should consider what you know about yourself and the definitions of the work values areas to confirm that these are your most important values areas. The numbered rows at the bottom of the COPSystem VIA Summary Profile Sheet (page 2) are an integrated summary of interests, abilities, and values. 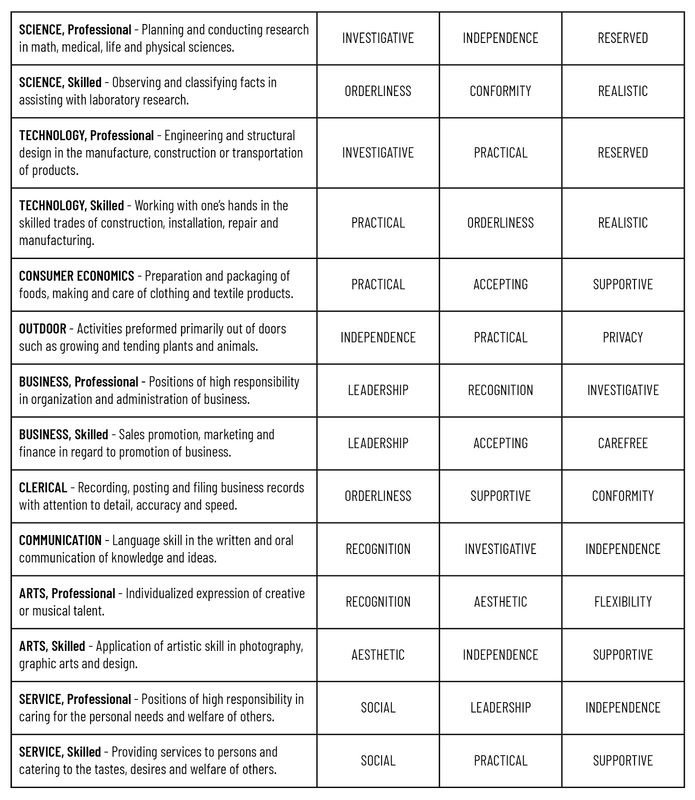 The highest interests, abilities, and work values have been marked with a plus (+) to indicate the career clusters most relevant. Career clusters with three plus marks (+) should be considered for initial exploration since high levels of interests, abilities, and work values have converged, which indicate a high degree of compatibility with jobs in that career cluster. Additionally, consideration is recommended for career areas that show high levels of both interests and values. With additional training over time, areas that show relatively low ability scores may be improved. A convergence of interests and values, as shown by two plus marks (+), reveals important information that may be used to direct an examinee toward possible future career options. 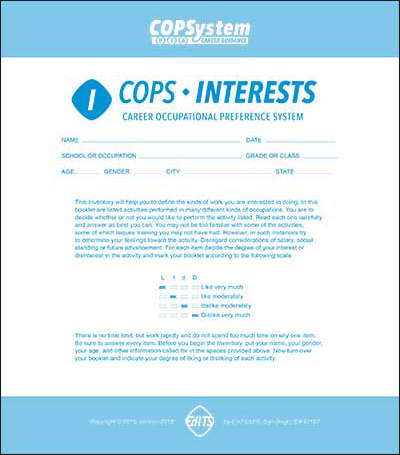 The summary section of the COPSystem VIA Profile Sheet integrates assessment scores from the COPS Interests, CAPS Abilities, and COPES Values. The remaining pages in the COPSystem VIA Comprehensive Career Guide define each career cluster, list multiple examples of occupations, including related courses of study and college majors, as well as the skills and abilities required to perform these jobs successfully. This set of three assessments measures unique individual characteristics that span occupational interests, abilities, and work values. This will allow examinees to begin career exploration in a meaningful way to help encourage a realistic and actionable strategy for advancing one’s future career goals. © 2018 EdITS LLC. All Rights Reserved.